A woman priest who starred in the BBC TV series Seaside Parish, is to leave Cornwall after four and a half years working around Boscastle. Reverend Christine Musser, 50, was watched by more than 3m viewers in the series about her job. She said she was leaving to join her husband Brett who has been appointed Head of Music at the Priory School, in Dorking, Surrey. She has taken the offer of a new post as priest in nearby Pirbright. Mrs Musser said it would be a "huge wrench" to leave Boscastle. She said: "We have shared much together and made many friends throughout these wonderful communities and I have greatly appreciated your support and your prayers during the last four and a half years. "This move will mean that we are both relatively near our children once more." Her last Sunday in the parishes will be on 24 June. 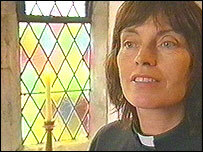 The Seaside Parish series of programmes spotlighted the work of Mrs Musser, including caring for parishioners after the flood of August 2004 which had a devastating effect on Boscastle. Bishop of Truro, the Right Reverend Bill Ind, said: "Christine was inundated with correspondence and offers of help of every kind at the time of the floods and the spirit of Boscastle and her ministry there, will not quickly be forgotten." Mrs Musser moved to Cornwall in 1990 with her three teenage daughters Emma, Heather and Sarah, following the break up of her marriage. She started work as a caretaker at St Ives Church and began a youth club. While at the church she also met Brett, who was head of music at a local school, and they married in 1999.